There are many conditions that can require a person to take a multitude of pills each day and for many weeks in a row. Whether vitamins, supplements or prescription medicines, each set of pills must be poured out of the bottles by dosage and taken at the correct time of day in order to keep one’s health properly balanced. This task can be long, tedious, and prone to mistakes when done under stress or while feeling unwell. For decades now, the primary solution has been a pill organizer, a rectangular plastic container with seven sub-compartments. However simply integrating taking your pills into your daily routine may not be enough. Doctors often recommend that certain medications be taken at certain times of the day. In order to get the best out of your medical regimen you must take the medications at that recommended time, usually in the morning or evening. Why does it work this way? The body responds to medications differently at different times during the day. Medications taken just before bed will help prevent symptoms that interrupt sleep or act up early in the morning. For instance, in the case of high blood pressure medication “ACE inhibitors and ARBs are most effective when taken at bedtime to help normalize blood pressure during the night” says KindredHealthCare.com, a knowledgeable online site for medical recovery services. Medications that treat recurring daytime problems, such as pain or allergies, are better taken a few hours before the symptoms are at their worst. The AARP suggests that “for afternoon pain … take meds around mid-morning to noon” when treating pain based issues like Osteoarthritis and to take “antihistamines morning and evening” for the recurring symptoms of hay fever. 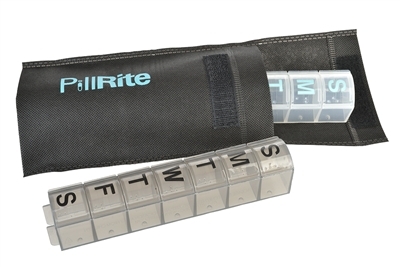 Using the 4-week PillRite medication organizer allows you to not only sort a full month of doses in advance but also split your daily pills into AM and PM doses. This, along with the MyPillList record keeping compartment can help you take your medications in order and on time. If you are facing the hassles of long-term pill organization, please contact us! We’d love to introduce you to the PillRite system. Pillbox Products is dedicated to improving the overall health and well being of patients by providing easy to use pillboxes to improve medication adherence.